Scotland is threatened by all three fracking technologies: Shale Gas/Oil, Coal Bed Methane (CBM) and Underground Coal Gasification (UCG). Exploration licences cover a relatively small area of land at present, but roughly a third of Scotland is being offered to fracking companies as part of the 14th onshore licensing round. The following round-up will take you through the companies that currently hold licences, their plans, and the rapidly growing community resistance that is fighting the industry every step of the way. Update 10th March 2015 see below. The push to frack Scotland has reached a new intensity with 4 companies now trying to move forward with fracking projects, with the Central Belt of Scotland particularly at risk. The stakes for Scotland have never been higher with Ineos (owner of the Grangemouth refinery) announcing the biggest fracking bribes to date. It must be remembered that these “incentives” are based on future profits from future production, so they are just as ill defined and ambiguous as the rewards for exploration for communities and councils “talked about” earlier this year. What communities can be certain of is that the bribes will not come close to compensating for the damage inflicted on them by the industry if it is allowed to go ahead. It is clear from Australia and the US where there is mounting evidence of harm caused by the industry and massively negative, economic impacts. Too big to fail Ineos, are no strangers to controversy and near disaster after dismal treatment of their workforce and safety scares at Grangemouth in recent months. Not content with a £350m project to import US shale gas it has now purchased a 51% stake in a UK fracking licence. PEDL 133 covers 127 square miles stretching from Linlithgow to Stirling and Falkirk to Alva. Update 10th March 2015 – INEOS has now bought 100 percent of the fracking licence (PEDL 133) around Falkirk and Sterling (127 square miles). INEOS has also applied for additional licences in the ongoing 14th Onshore licencing round, the results of which are due to be announced in the next few months. Update 13 Oct 2014 – Ineos have now acquired an 80% stake in PEDL 162 held by Reach CSG, covering 154 square miles north east of Glasgow. Reach CSG, said that the sale would effectively underwrite planned exploration spending in the licence area which would include two vertical wells and a seismic survey. Ineos executives have their sights set on the black metal and lothian shales under PEDL 133 despite the fact that 100,000’s people live there. Their promise of rewards is for landowners and homeowners only. Ineos define a shale gas community as the 39 square miles around a cluster of 200 wells. This makes no secret of the fact that they intend to drill 100’s of wells in PEDL 133. What they don’t mention is the 24 hour drilling and temporary gas infrastructure that this “extension of the Grangemouth refinery” would require. Dart’s modular processing plant reveals project scale (click to enlarge). Multi well drill sites, processing plants to clean and odourise the gas, compressor stations and pipelines to move the gas, an armada of heavy vehicles and huge volumes of liquid, solid and gaseous waste to dispose of. All this for 600-700 wells that will run dry in 3-5 years and supply Scotland with just 12 months of gas if they can recover a very ambitious 10%. Ineos purchased their share of PEDL 133 from BG Group who increasingly prefer to keep their fracking activity out of sight in Australia and the US. Dart Energy own the remaining 49% of the shale rights and 100% of the Coal Bed Methane (CBM) reserves in PEDL 133. The community descends on Darts Farndon drill site in Cheshire (click to enlarge). Dart Energy are no strangers to conflict. In the face of strong community resistance they slashed their workforce and moved out of Australia completely. In conflict with their own shareholders they were forced to restructure, cancel an IPO and sell interests. When their flagship project at Airth near Falkirk was slowed to a crawl Dart looked south to the Bowland Shale in Cheshire but immediately faced more community resistance. A proposed drill site at Upton has been occupied for 5 months. There are now 17 community groups in an active coalition “Frack Free Dee” opposing all drilling in Cheshire. Dart’s proposed CBM development at Airth (click to enlarge). The significance of Dart’s project at Airth must not be underestimated, it is the first application for the production of unconventional gas in the UK. Dart have been trying to get approval to drill 22 CBM wells since 2012. This project gives a first glimpse of the intensity of the industrialisation of the landscape, proximity to people and animals, and the volumes of toxic waste water the CBM process produces. To release methane gas from coal seams 850m below farmland Dart will have to pump out the ground water that is trapping the gas. If pumping stops, the gas stops flowing, so this “produced water” is an inevitable consequence of CBM production. Dart have already disposed of four million liters of this carcinogenic effluent from it’s test sites into the Firth of Forth and their plans require the dumping of many hundreds of millions of liters more if the project goes ahead. The Concerned Communities of Falkirk present a Community Charter opposing Dart’s development at Airth. The community responded to Darts application for production with a record number of objections forcing Dart to appeal to the Scottish Directorate of Planning and Environmental Appeals (DPEA). At the inquiry earlier this year they faced a legal team representing 90,000 Scottish residents. The Scottish Government has now recalled the planning appeal removing the decision from the appointed reporters. Scottish Ministers will now take the final decision. Throughout this time Dart have treated the communities that will be effected by their plans with contempt and threatened legal action at every opportunity. When asked how many wells they planned to drill they never conceded more than 100 while their presentations to investors and estimations of recoverable gas suggest that they would have to drill at least 600 wells in the area to recover the quantities of gas they claim to be under the region. Dart have always maintained that they will not be using hydraulic fracturing despite the fact that 10% of 5,000 CBM wells in Australia have already been fracked. With new partner Ineos dead set on exploiting the shale in PEDL 133 the residents of the Midland Valley are looking at 1,300 wells in this small licence block alone. In the last few months Dart have threatened to start drilling again in Scotland, this time for a core sample of coal at Skinflats near Grangemouth. They managed to secure permission to drill before the outcome of the planning inquiry by threatening Falkirk Council and the RSPB with legal action. Dart’s final fling is foreshadowed by the outcome of the planning inquiry for the Airth project and their impending takeover by IGas, one of the largest fracking companies operating in the UK. IGas will inherit the outcome of the planning inquiry and everything Dart owns including PEDL 133 and three other large licence blocks in Scotland (PEDL 163 & 161 in Fife and PEDL 159 in Dumfries & Galloway). What they also inherit in Scotland is a massively increased community awareness of fracking and it’s associated risks. The buyout will increase IGas’s access to frack 1 million acres of the UK. However, the inherent problem that IGas, Cuadrilla and the rest of the unconventional gas industry face is that they need to drill 8 or more wells in every square mile of every license area. Regardless of their size, financial backing and government support, the interests of these companies are in direct conflict with the interests of millions of people who live in the areas of the UK with shale deposits. People from threatened communities across the country gather to march on IGas’s site at Barton Moss, Salford (Click To Enlarge). IGas started out as a CBM exploration company but have recently embraced shale gas exploration. At Barton Moss they exceeded their planning and drilled a much deeper well below the coal measures to sample the shale rock. The drill site at Barton Moss created strong community response from the surrounding area and from people across Manchester. 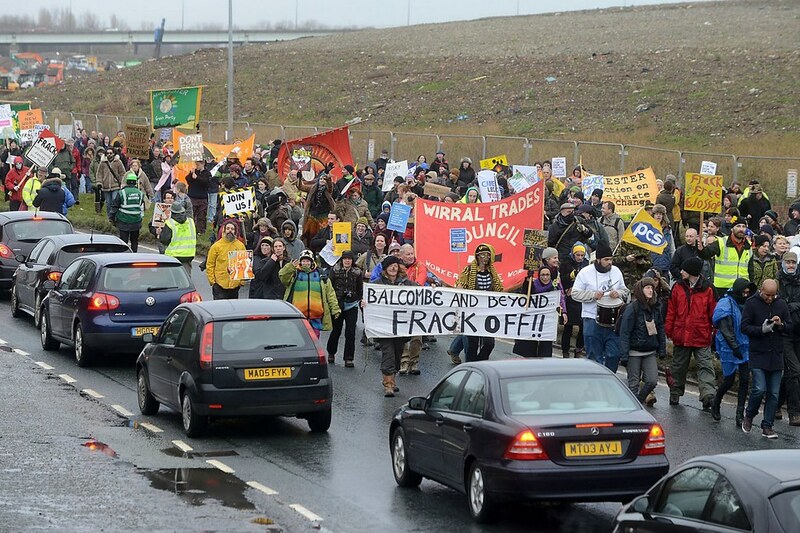 A 5 month blockade, numerous marches in Manchester and a huge number of effective direct actions and community mobilisations slowed the projects progress and shone a light firmly on IGas’s ambitions to frack with no regard for the local population. IGas now face similar resistance at it’s Ellesmere Port site with a growing and conspicuous community campaign generating column inches and damaging PR that blights the industry wherever it goes. With Ineos and other partners demanding progress IGas has it’s work cut out and the communities of the Central Belt of Scotland have a new target. 5 Underground Coal Gasification (UCG) Licences have been issued by the Coal Authority in the Firth of Forth (click to enlarge). Underground Coal Gasification (UCG) presents a massive threat in Scotland. There are 5 large UCG licence areas already in place for coal seams under the Firth of Forth and Cluff own two of them. As a technology UCG is highly experimental and the burning of coal in under-sea seams has never been tried like this before. Small scale onshore trials of UCG over the last 80 years have invariably resulted in severe water contamination and/or explosions. Three trials in Australia all released cancer-causing chemical into the environment resulting in prosecution and fines by the Queensland government 1, 2, 3. The Underground Coal Gasification process is experimental and the burning of coal in offshore seams has never been done before (click to enlarge). In simple terms companies plan to drill pairs of horizontal wells from land out into under-sea coal seams. One well is used to inject heat and air/oxygen to ignite the coal, the other is used to extract a synthetic gas consisting of carbon monoxide, hydrogen and methane. A commercial plant would require hundreds of pairs of wells and massive onshore refineries producing huge volumes of liquid and gaseous waste. The extreme nature of the process, piping superheated toxic and explosive gas up to the surface also means that catastrophic accidents can occur. Cluff Natural Resource have acquired 8 of the 27 UCG licences issued by the UK government via the Coal Authority. In the last year it has focused it’s attention on the Largo Bay license area in Fife. Cluff have already been scared away from a site in Warwickshire by a vocal local campaign so the time is right for concerted community resistance in Fife. Cluff is actively seeking investment as the only thing it is currently burning is £3 million of capital. In December 2013 CEO Algy Cluff attended a meeting with 100 well informed local residents in Methil. The meeting was far from successful and most people came away with many more unanswered questions. The company is pressing ahead regardless and has recently taken on a project manager. It is looking at several brownfield sites adjoining the Firth of Forth on which to build a pilot installation, possibly submitting a planning application in the first half of 2015. Large areas of Scotland are available for fracking in the 14th onshore round (click to see full UK map). A start-up company called Reach CSG hold PEDL 163 covering an area to the east of Glasgow. They too are looking for investment but have also been forced away from a proposed site at Moodiesburn by an effective community campaign. However, the imminent 14th Onshore Round could see many more companies both large and small acquiring licenses as the whole of the central belt of Scotland is up for grabs. Faced with this threat and uncertainty the best course of action for every community in Scotland is to get informed, get organised, get conspicuous and get training. If you want to start a group or would like to organise a public meeting in your area please get in touch. If you are already part of a group and would like to receive training in effective campaigning, knowing your rights, media skills or community action training we can help. All over the planet community groups are stopping the fracking industry in it’s tracks. This film from Australia shows how community members from all walks of life are learning new skills and taking the simple steps they need to protect themselves. This entry was posted in Blog and tagged Airth, Scotland, Dart Energy, Featured, IGas, Cluff Natural Resources, Ineos. Bookmark the permalink.